This past week during one of my workouts I listened to a teaching by Rob Bell at Mars Hill Church in Grand Rapids, MI. He taught about Acts 2: 42-47 (see http://www.biblegateway.com/passage/?search=acts%202:42-47&version=CEV for the Bible verses and http://marshill.org/teaching/2011/10/09/how-it-works-in-our-house-acts-2v42-47/ for the sermon). In his teaching, Bell made mention of the Social and Health Index that uses indicators like prison rates, mental illness, life expectancy, drug addiction, obesity, children’s education, and homicides to compare how nations are doing serving their citizenry. He also detailed how inequality influences health. I didn’t catch a citation on which he was basing his information. I know of work sponsored in part by the French to develop a health index that could be used instead of the GDP to compare countries and in which GDP was but one indicator of national health. But in googling around I came across the site Inequality.org and their report on inequality and health that I suspect was the basis for Bell’s claims (see http://inequality.org/inequality-health/). The report is itself based on the work of The Equality Trust, an organization based in the United Kingdom that has been compiling comparisons of health and inequality for the 22 richest nations. The ratio of wealth for the top 20% compared to the bottom 20% is 8.5 for the United States, compared to a ratio under 5 for Japan, Finland, Norway, Sweden, Denmark, Belgium, and Austria, and closely followed by Germany and the Netherlands at 5.2 and 5.3 respectively. By contrast we have the highest infant mortality rate by some margin of the same richest 22 nations and an overall lower life expectancy than all but Singapore. This is not just a reflection of deaths by the poorest Americans, as these trends exist across all socio-economic strata in a given metropolitan area of the United States. 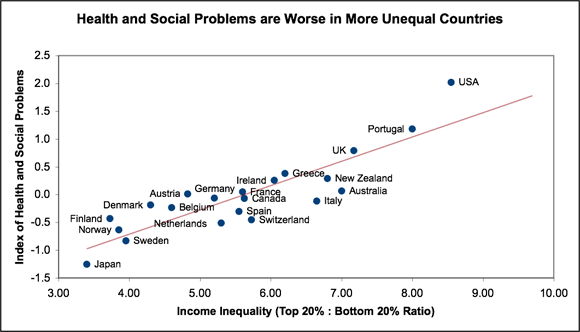 NEW: Here’s a great Ted Talk by Richard Wilkinson that does a great job describing the impact of economic inequality on health and social problems. I highly recommend checking out both the sermon and the report!